"Home is where the heart is" and for the past 29 years, you have made Ear Abstracts an amazing home. Although we may be moving from this location we assure you that the heart beats on. With heartfelt appreciation we invite you to our MOVING SALE! EVERYTHING MUST GO! Hurry in for best selection! Brighton Charm Event and Exciting News! This Wedneday, send your man in to get all his Christmas shopping done! Don't forget to fill out your wish list or send him in with a few hints :) He'll enjoy a hassle-free shopping experience and free gift wrapping. RSVP for your man and he will receive $20 off his total invoice that day! Join us Saturday, December 2nd for our annual Brighton Open House. We will have a drawing every half hour for some fun gifts, including a Brighton handbag. *You must be present to win. RSVP for a $15 gift certificate to use during the event. Scroll down to see what fun prizes you can win! Would you like to bring a guest? If yes, how many? If no, you can skip this step. Come see the newest Fall/Winter collection before anyone else! Spend $100 or more and we'll take $20 off your invoice! Now till August 10, buy two Brighton rings at the same time and get a third one free. For more details visit us in-store! With the Brighton Handbag Trade-in Event going on, we have decided to focus this entire week on handbags! This coming Saturday, we will be giving you the opportunity to personalize your very own handbag, and by doing so, you will be entered to win the items that you used in the making of your custom creation. RSVP today to receive this adorable Pebble Heart Valet Key Fob absolutely FREE when you participate in our event. RSVP below to receive your Pebble Heart Valet Key Fob absolutely FREE! It will be the last weekend to take part in the Brighton Handbag Trade-in Event. *Donate any manufacturer's handbag to qualify. Purchase a Brighton Handbag of $150 - $249 and receive a $25 bonus; purchase a Brighton handbag of $250 or more and receive a $50 bonus. This offer excludes Live Love Travel Wallets. Limited to stock on hand. Join us for our Snappy Summer Handbag Event Friday, July 14, 12 pm - 4 pm. Brighton's national sales manager, Gabrielle Fisher will be here to introduce our new Brighton representative, Emily Wollenman. At the event, you will have a chance to preview some of the latest Brighton accessories (they are not even in stores yet). You will also get the chance to learn how to personalize their Brighton Snappy Handbags like a pro. We will also be celebrating the start of Brighton's Annual Handbag Trade-in Event! Join us Wednesday, June 28, 2017, for our UNOde50 Trunk Show from 2:30 pm - 7:00 pm. Our rep, Kris will be here to answer any questions you have and show you these brand new, beautiful pieces. Be the first to see and pre-order the new Fall/Winter Heritage Collection! FREE GIFT & $20 off any Uno de 50 purchase of $100 or more! Plus, we'll be offering additional markdowns! You won't want to miss this event! For a sneak peak at the new collection, check out our blog post, Heritage Collection by UNOde50. Join us Saturday, June 24, 2017, for our annual Patriotic Party. We will be featuring all of our latest red, white, and blue items along with everything MADE IN THE USA. RSVP and attend the event to receive the adorable Brighton pouch at checkout absolutely FREE. We can't wait to see you all this Saturday. RSVP Below for your FREE gift! It’s the 50th anniversary of the Summer of Love –when Utopianism and the expression of graphic arts were at their height. Those free-spirited designs that gave Art Deco images a modern twist are celebrated in our designer Tom Clancy’s exclusive artwork adorning this pretty and practical tote. This limited edition canvas tote celebrates the 50th anniversary of the Summer of Love, making it a perfect gift for anyone who adores the free-spirited fashion of that era. Matches our Summer of Love necklace, also designed by Tom Clancy. We're right on the Pop Art fashion trend. Starting tomorrow till June 4, get designer Tom Clancy's Summer of Love necklace free when you purchase $75 or more of Brighton accessories at the same time. In stores only, while supplies last. This Saturday, April 6th, we will be having our annual Mother's Day Tea. From 11 am - 2 pm, we will be featuring all of our favorite gifts for Mother's Day. Our sales girls will be here to make sure you find the perfect gift for all of the special mothers in your life. No matter what your budget is, we are confident that we can help you find, or create something she will LOVE. Customizable Gifts: Think Brighton charm jewelry! Throughout the duration of the event, we will be serving fresh Tea from Tea and Teacups along with appetizers. RSVP and show up to the event for a FREE gift at checkout. RSVP BELOW as soon as possible to make sure you get on the list for your free gift. Everyone is welcome so bring your mother, daughter, sister, or any other friend you can find and let us help you find the perfect Mother's Day Gift! Also, this is the last weekend to take advantage of the Ears to You promotion. Join us this Monday, April 10, 2017, for our UNOde50 Trunk Show! We will be featuring UNOde50's new Summer 2017 Collection- Available for pre-order. Get the newest designs before they even hit stores. UNOde50 is known for creativity, unique style, & bold spirits. All of their jewelry is handcrafted in Madrid, Spain. Hang out with our UNOde50 stylist Kris Turner. She will be at our event to make sure that you find the perfect pieces to fit into your wardrobe. During the event, we will be serving appetizers and refreshments. So bring a friend, and have some sangria on us! RSVP below to receive a free gift with purchase! 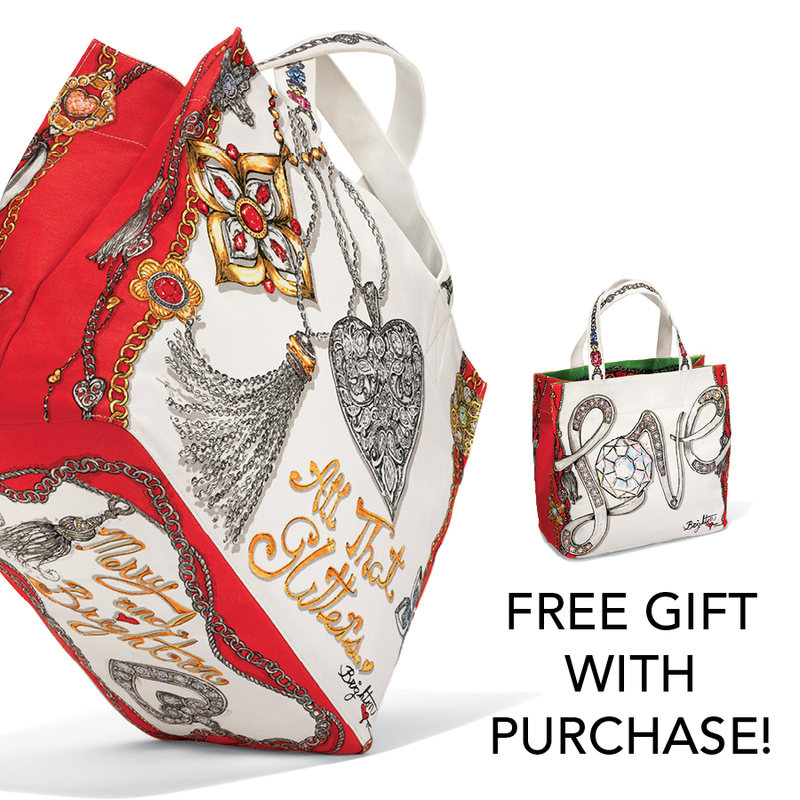 Now through February 10th, spend $100 in Brighton and get a FREE Brighton Sweet Heart Tote! Join us Thursday, January 19, 2017 for our UNO de 50 Trunk Show 3:00PM - 7:00PM! We will be featuring the latest jewelry from Uno de 50 for special order. UNO de 50 is known for creativity, unique style, bold spirits, and it is handcrafted in Madrid Spain. Our UNO de 50 stylist, Kris will be here to make sure that you find the best accessories to add to your wardrobe. You will be able to purchase from our existing collection or special order pieces that will arrive in time for Valentine's Day. Win this Uno de 50 Bracelet! Celebrate National Hot Tea Day with us this Thursday, January 12th. We will be serving hot tea from Tea & Teacups all day long. Bring a friend or two & share a cup of tea while you catch up on life. We promise you ladies won't run out of things to look at. Get a FREE Brighton Be My Love Necklace with any single, same-day Brighton purchase of $100 or more.